I’m from Philly and I REALLY love basketball. And if you’re from Philly and REALLY love basketball…then you 9 times outta 10 love John Chaney. Now, for those of you who aren’t from Philly and don’t love hoops, John Chaney was the legendary basketball coach at my parent’s alma mater Temple University. So, why is John Chaney’s name coming up if I’m talking about John Calipari’s new book? Well, simply put it’s because I love Chaney SO freaking much, that it pains me to say that I actually like (not love) John Calipari. Why is that you may ask? Just google “John Chaney vs. John Calipari” and you’ll get what I’m talking about. But let’s just say it had something to do with Chaney saying he would kill Calipari. So now ya’ll get it….so how can I like a coach who one of my hoops hero wanted to kill?!?!?! For YEARS I refused to root for Cal simply because of Chaney…that’s how deep my Philly roots run. Plus, from that corny “Refuse to Lose” motto up at Umass to the New Jersey Nets fiasco he was a part of…I wasn’t foolin’ with dude. But once my man Juanny from Camden went down to Memphis to play with Cal, the healing process started. And by the time D. Rose was running point for him, I actually started to root for dude and by the time Wall was running Kentucky’s squad, I was all in with Cal. The only problem now is he’s coaching at University of Kentucky…and I HATE the University of Kentucky! See, for me anytime I think of Kentucky, I don’t think of Jamal Mashburn, Antoine Walker or my main man Tubby Smith. Nope…ALL I can think of when it comes to Kentucky is Adolph Rupp with his Donald Sterling way of thinking. 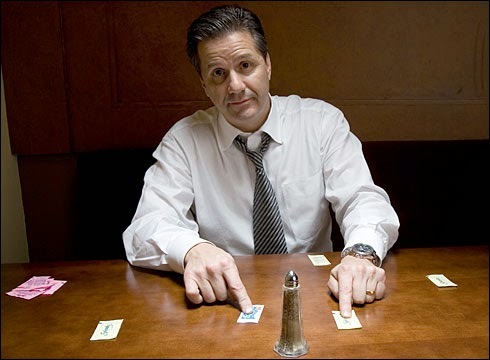 But even with ALL of that going against Cal…I still like him. In fact, I like him so much that when my squad Uconn played them for the chip this year, I wasn’t as stressed out as I normally am because I knew if we did lose, that Cal would’ve won. Now don’t get it twisted, I would’ve been DEVESTATED if we lost (and devastated is a nice way of saying how I would’ve felt) but there’s never been a NCAA chip game that if the team I was rooting for lost, that I could ginuinley be happy for the other squad. Well, let’s just say I’m happy as hell that we won but even with me and my 8 year old daughter running around the house celebrating Uconn’s 4th chip, a really, really, really small part of me kinda felt bad for Calipari. See, I can’t stand these new school folk who don’t like Calapari because he recruits a bunch of one and done players. So if he did win the chip…he could shut them up for at least a year or at least until his next all freshmen squad takes the floor in Kentucky. In “Player’s First”, Cal dives into a ‘lil bit about any and everything you would wanna know about him. From how he got his start in the coaching game under Larry Brown, his time at Umass, Memphis & Kentucky and getting those wins and Final Four appearances taking off the books to going from winning the chip one year to the NIT the next, the differences between coaching those all star point guards he had under his belt and his thoughts that it was other coaches who dropped dime on him which got the NCAA looking more closely him and how he recruits. (which is what I always thought cause as soon as he got Wall, who’s from NC over UNC AND Duke…I knew Roy Williams & Satan aka Coach K wasn’t having that) He even mentions my main man John Chaney and in a good way…I think. But what I dug the most about this book was Cal breaking down how he recruits and motivates his squads. I mean, the dude does damn near have a new squad every year and I’ve always wondered how he gets these McDonalds All American to play together in peace and harmony with each other and he breaks all of that down. In fact, after finishing the book, I got a RACK of new ideas on how to motivate and push the knucklehead teens that I work with in Southeast Washington DC to look at the game of life different so for that alone I loved the book. But at the end of the day if you’re a college hoops junkie like I am then there’s absolutely no way that you won’t rock with this book. In fact, it may just be the thing that brings some of you Calapari haters over to the other side of the tracks.